Nothing tickles me more than finding the things she leaves for us like the above note written in the corner of the kitchen blackboard. Tucked under the ongoing grocery list, I found that little nugget of happy the other day. Other nuggets of happy this week? After a few weeks of wondering what the heck was causing such low water pressure in the upstairs shower, having (mostly) ruled out a catastrophic leak, I decided to clean the shower head. Mollie had mentioned reading that removing your shower head & soaking it in vinegar helped removed build up. We definitely had some of that going on, but who knew that was what causing the drop in water pressure? It’s an entirely brand new shower thanks to a cup of vinegar & 5 minutes of my time. I’m still high fiving myself five days later. I am fast at work on my latest & greatest endeavor that I’ve been babbling about to anyone who will listen since last spring. It sat simmering on the back burner for quite some time as I studied similar projects and made my mind up about how I wanted to approach this. I got serious back in January, when I set dates & firmed up a venue. I have a budget of zero, so the less I spend out of pocket prior the better. Which means doing my own website design. Completely overwhelming stuff, but after putting out a plea Wednesday on Facebook, I sat down on Thursday and figured out major, major stuff all by my big girl self. High five me. I might just overhaul this site with that knowledge once I get the new one up & running. I spent most of Tuesday afternoon outside soaking in the 70 degree weather catching up with several girlfriends. It was glorious. In the busy-ness of last fall, I forgot to make time for many friends. This winter did not help, so I’ve decided that from here on out this year, I’m making more time for friends. Tuesday I had tea with my dear friend Pat, then had a glass of wine with Mo later in the afternoon. When I went to bed, I realized I had gotten some sun – to the tune of my nose being just a bit pink. From here on out, I’ll be sure to wear my sunscreen, but that first bit of sun was a delight. Sign of spring – Soccer starts back up this weekend. The core of the team is primarily the sixth & seventh grade neighborhood girls who still play rec soccer, their best buds & soccer mates they’ve accumulated over the years. Which means they play really well together & some of these girls have played together a long time. Wandering by practice the other day (it’s on the field at school two blocks up), I realized how much of our spring & fall social life is centered around soccer. I really might be a soccer mom after all. Crocus blooming. Daffodils getting ready to. And the hint of a peony poking up through the soil. Peonies people! Nothing makes me happier than that. 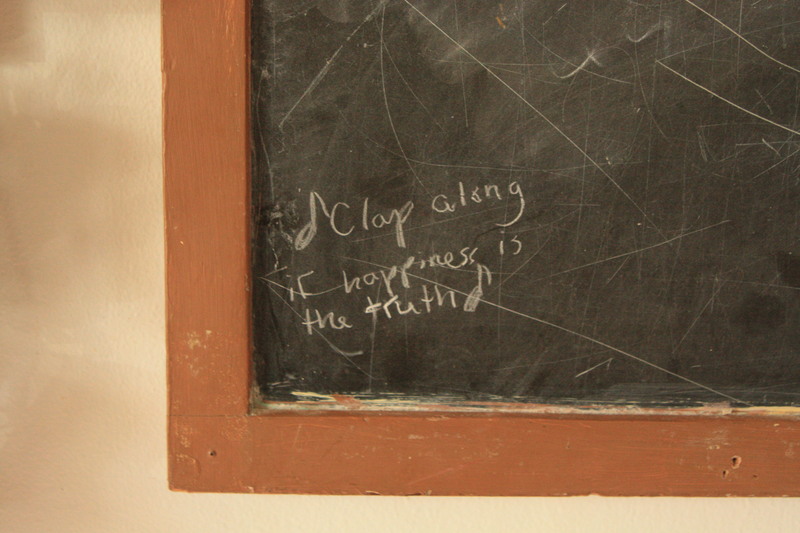 Love that little note on the blackboard…Edie is a gem! Am so enjoying the time change…it’s an instant mood lift for me. I stay much more energized. Hopefully, this means I will get some things accomplished. Actually, I have I made four quilts in three days…yay me, now I’m taking a break! She is an absolute sweetheart. I love the longer days in the afternoons & evening! I decided the dark mornings were a great excuse to continue to leave up a few strands of Christmas lights to light our way in the mornings. I think I’d have less trouble with the time change if I was actually sleeping through the night 🙂 I am enjoying the later evenings, but what I really want is summer, when I don’t have to drag myself out of bed to get Emma to school! I love Edie’s note 🙂 And I’m SO envious of 70s and some signs of growing things. I have another 3 weeks before that happens, I think. I can report it has been chilly ever since & we shall not discuss the upcoming weather forecast. Just no. YOU ARE IN MY BLOG READER! Yay! Oh, how wonderful to have shower pressure again. You deserve a LOT of high fives and fist bumps–so many great things accomplished and ALL BY YOUR SELF! I’m most proud of the shower pressure. I like to have my skin scalded in every way possible, so now that my shower head is like a firehose again, I’m oh so happy. I played around with some settings on my old blogger site – maybe that’s why I’m showing up in your blog reader? I’m still slightly an idiot savant despite my bragging of figuring things out.